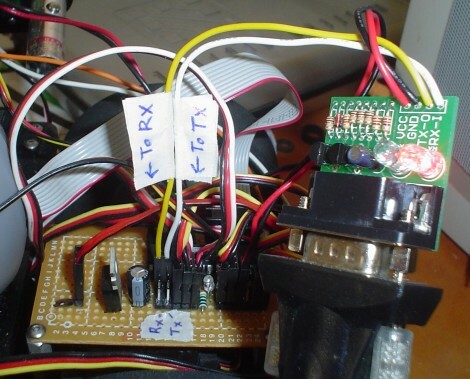 To add UART functionality to your $50 Robot (or any AVR based microcontroller) you need to make a few minor modifications to your code and add a small amount of extra hardware. Now of course I could just give you the code for you to use right away and skip this tutorial, or I can explain how and why these changes are made so you can 'catch your own fish' without me giving it to you in the future . . .
Now about the speed increase . . .
We will be using the maximum frequency that your microcontroller can handle without adding an external crystal. How do you know what that frequency is? From the datasheet of your ATmega8/ATmega168, we can find: "By default, the Internal RC Oscillator provides an approximate 8.0 MHz clock." Listed in the 'System Clock and Clock Options->Calibrated Internal RC Oscillator' section. Since we do not have an external crystal, we will configure the entire system (all individual components and code) to 8MHz. If you want a different frequency, I will also show you how to change it to your frequency of choice. 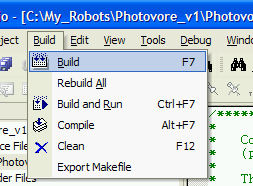 These are AVRlib files needed to do the hard UART and printf commands for you. If you are using the $50 Robot source code, then you already have AVRlib installed and ready to use (so don't worry about it). Otherwise, read the instructions on installing AVRlib. Now your compiler knows to use these AVRlib files. If you aren't using SoR_Utils.h, just add these lines at the top of your code where you declare includes. I recommend not using the timer because its default interrupt settings will cause your servos and UART to spass out . . .
Now BE VERY CAREFUL IN THIS STEP. If you push the wrong fuse, there is a possibility you could permanently disable your microcontroller from being further programmed. BAD JU-JU!!! 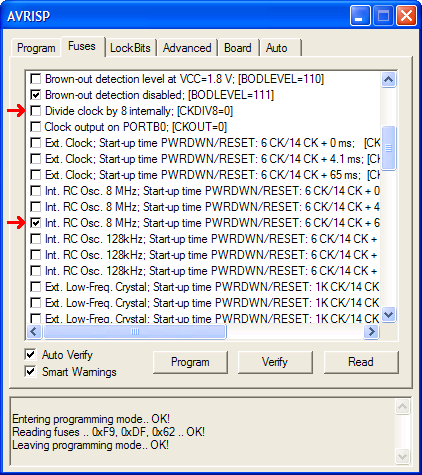 Click the Fuses tab (see below image), and uncheck 'Divide clock by 8'. Having this setting checked makes your clock 8 times slower. Having a slower clock makes your microcontroller more efficient, and unless your algorithm requires a lot of math, a fast processor isn't needed. But in this case we want a fast UART speed, so we need the faster clock. Now check the 3rd 'Int. RC Osc. 8Mhz'. By default this should already be checked, but I'm noting it just in case. If you were using a crystal or a different frequency, just scroll down in the Fuses tab for other options. Writing fuses .. 0xF9, 0xDF, 0xE2 .. OK! Reading fuses .. 0xF9, 0xDF, 0xE2 .. OK! Please note that the $50 Robot was designed for the lower clock speed. What this means is that all your functions that involved time will operate 8 times faster. In terms of processing this is great! But all your delay and servo commands must be multiplied by 8 for them to work again. Now we need to select a baud rate, meaning the speed at which data can be transferred. Typically you'd want to have a baud of around 115.2k. This is a very common speed, and is very fast for what most people need. I immediately found the column marked 8.0000 MHz (the internal clock of your microcontroller), which I circled in green for you. Then I went to the row marked as 115.2k, marked in blue. Now what this means is that your UART can do this baud rate, but notice that it says the error is 8.5%. This means that there is a good chance that there will be syncing problems with your microcontroller. Error arises from the fact that Fosc is usually not a standard UART frequency, so the baud rate when you divide Fosc by some number isn't going to be a standard UART frequency. Rather than bothering with this possible problem, I decided to go down a few rates to 57.6k (circled in red). 3.5% could still be a bit high, so if you have problems with it, go down again to 38.4k with a .2% error (mostly negligable). So what error rate is considered optimal or best? It depends entirely on your hardware and so I don't have an answer for you. If you want to learn more, feel free to read about how asynchronous serial transmission is 'self synchronizing'. Be aware that even if your microcontroller UART can operate at your desired baud, the adaptors you use might not be. Check the datasheets before deciding on a baud rate!!! It turns out my RS232 Shifter is rated for 38400 in the datasheet, so thats the baud I ended up with to do this tutorial. Relax, the hard part is done! Now we need to add a line in our main() code that uses the UART. You don't actually need to output a sensor value, but figured I'd show you how now so you can try it out on your robot sensors. Now plug the power connections (regulated 5V and ground) into an unused header on your circuit board just like you would a sensor (the sensors use regulated 5V). Then plug the Tx of your adaptor into the Rx header of your microcontroller, and then the Rx of your adaptor into the Tx header of your microcontroller. Don't know which pin is which? Check the datasheet for the pinout and look for RXD and TXD. Or look at the $50 Robot schematic. It just so happens that you probably have servos on pins 2 and 3 - oh no! 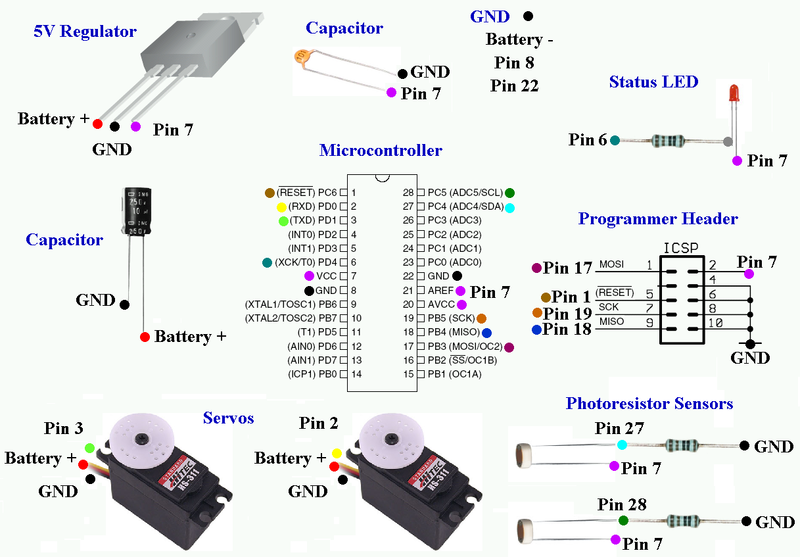 Don't worry, just move your servos onto a different pin, such as 4 (PD2), 5 (PD3), and/or 6 (PD4). Don't forget to make that change for your other servos, too. Notice how I labeled my wires and pins so I didn't get them confused (with the result of maybe frying something). I used wire connectors to connect it all. At the top right is my RS232 Shifter and at the bottom right is my RS232 to USB adaptor. Let's do a quick test. Chances are your adaptor will have a transmit/receive LED, meaning the LED turns on when you are transmitting or receiving. Turn on your robot and run it. Does the LED turn on? If not, you might be doing something wrong . . .
My adaptor has two LEDs, one for each line, and so my Rx LED flashes when the robot transmits. Now you need to set up your computer to receive the serial data and to verify that its working. If you are using an adaptor, make sure it is also configured for the baud rate you plan to use. Typically the instructions for it should tell you how, but not always. So in this step I'll show you one method to do this. Go to Ports, select the one you are using, and right click it. Now configure the settings as you like. I'd recommend using the settings I did, but with your desired baud rate. 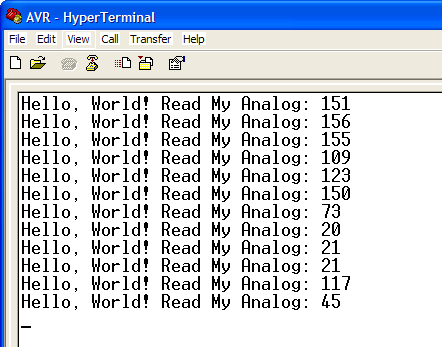 To view the output data, use the HyperTerminal tutorial to set it up for your desired baud rate and com port. Make sure you close out the AVR programming window so that you can free up the com port for HyperTerminal! 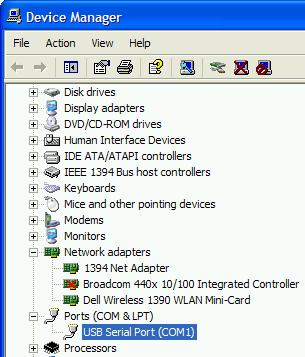 Two programs cannot use the same com port at the same time (a common mistake I always make). If it isn't working, consider doing a loop-back test for your UART debugging needs.